Posted on November 3, 2014 - Get free updates of new posts here. The time it takes for your website to load is an often ignored metric in online marketing but one that can have a significant effect on both your conversion rate and your search rankings. A study by Akamai found that 57% of online shoppers will only wait 3 seconds for a page to load before abandoning the site with younger users being even less patient. 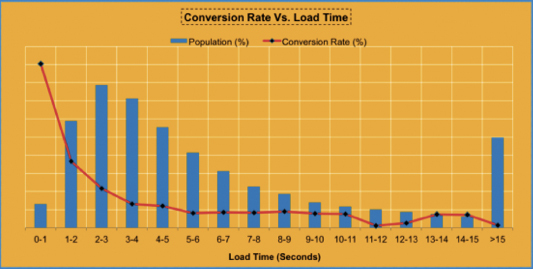 The conversion rate impact of a slow loading site are notable with the biggest retailer in the world, Amazon, calculating that a page load time of just 1 second extra could cost $1.6 billion a year in sales. Google have also worked out that slowing its search results by four tenths of a second could lose them 8 million searches a day which would significantly lower their advertising revenue. There are plenty of real world examples as well, for example Mozilla who shaved 2.2 seconds off their average load time and increased download conversions by 15.4% – equivalent to 60 million extra downloads per year. Along with conversion rates, site speed also impacts SEO results with Google announcing back in 2010 that they were now taking into account site speed – especially for searches done on mobile devices which are typically on slower internet speeds. Whether you are hosting through a third party or have your own server setup there is always improvements you can make to your hosting. The speed and reliability of the server you are hosted on can have a big effect on the site load time, as can the location. If you have your own server, ensuring you have the latest equipment with up to date software is important and should be regularly assessed and improved. If you are utilising a hosting service then picking the right company who keep their equipment up to date and the right service (Shared vs Dedicated hosting for example) is very important and something that should be regularly reviewed. 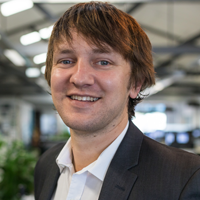 If you are a business targeting predominantly New Zealand customers then it is imperative your server is based in New Zealand as domestic load times will be a lot quicker than international. It is worth looking into whether you can take advantage of niche hosting for your website as well, for example if you have WordPress there are many hosting options specifically available such as Wp Engine or WP Net (NZ based). For my website I use VentraIP, an Australian based company that I have been impressed with and who has improved my site speed due to the servers they use. One of the major issues with slow loading websites is image loading time. Through a combination of image size, quality and the use of incorrect image types a website load time can be significantly affected. All images on a website should be resized to the maximum dimensions (in pixels) they will be used, one problem I frequently see is an image file which has large dimensions and is then resized by html code – using your images in this way will mean the website visitor needlessly downloads the image at the highest dimensions. Along with the dimensions of the images used the quality of an image is usually too high for websites with print quality images common. Saving the images in the optimal format and quality for your website and then compressing them through a service such as Smush It or an image compression plugin for your CMS will vastly decrease the size of each of the images by removing unnecessary data in the image and improve your overall load time. Similar to how you compress files on your own computer into a .zip file you can compress the files you serve visitors to your website. The most common type of compression used online is Gzip which automatically compresses your files, sends them to the website visitor at which point the visitors browser automatically unzips the files and shows the content. I have enabled Gzip on my website and its resulted in my file sizes being reduced by a whopping 72%. Installing Gzip is relatively easy and there are no real downsides. You can check if your website has Gzip compression already here. Minify your code and remove all unnecessary characters such as blank spaces. Use CSS instead of images wherever possible (for example to create buttons). Use a tag manager to streamline your third party codes and load them asynchronously. Clean up any databases your website uses deleting old database entries. Use CSS Sprites as an alternative to slicing icons and other graphics used on your website. Browser caching is a feature that stores copies of your website files on a visitors computer so that when they come back to your site they do not need to redownload them. This functionality has no effect on first time visitors but for repeat visitors it can significantly improve the website load time. You can customise the length of time a browser is allowed to cache your files meaning even if you change your files often, caching can still be a good solution. The easiest way to set up caching is through a plugin for your CMS such as W3 Total Cache for WordPress. If you are on a custom system and have a talented developer however there are plenty of instructions online they can follow to implement caching. A CDN is a network of high performance servers located all around the world which you setup to host your static website files. This is especially useful for websites that get a lot of international users, as the CDN network has servers in most countries allowing visitors to download your website files from a location close to them, and improving the site load time. Using a CDN also adds an additional layer of security and reduces the server load and bandwidth on your actual server allowing it to quickly load any dynamic content. Their are a number of CDN providers with Amazon, MaxCDN and CloudFlare among the most popular. 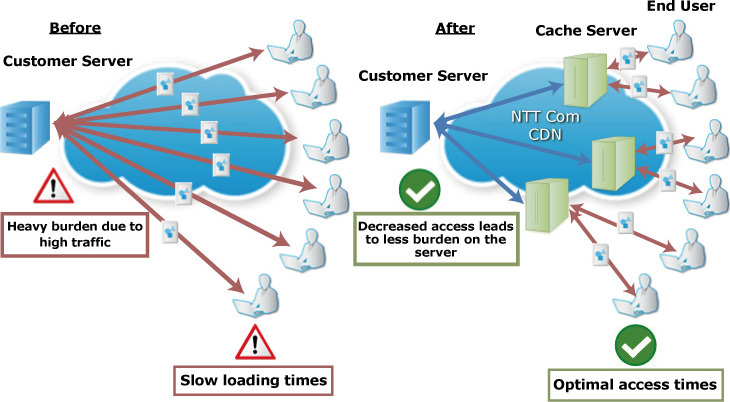 An example showing how NTT Communications CDN works. Google loves fast loading websites – the quicker you get your information the better your experience and the more likely you are to perform another search. To help website owners improve their speed they have created an open source webserver module which automatically applies best practice techniques to your server to optimise the delivery of your website. The PageSpeed Module applies a lot of the techniques mentioned above so may conflict with other functionality, however with a bit of testing and customisation should help improve your website speed. To find out more about this module and how to set it up click here. Google PageSpeed Insights – analyses your site and provides suggestions to improve your website. Pingdom & WebPage Test – lets you know how long your site takes to download and exactly what files are taking the longest to load. Y Slow – a plugin for your web browser created by Yahoo which offers suggestions on how to improve the page performance. GTMetrix.com – tests your site on a combination of Google & Yahoo best factors and provides actionable recommendations from each. Analytics Site Speed Setting – a modification which allows tracking of page speed times inside Google Analytics so issues can be identified and the site speeds effects on other metrics can be measured. If you know of any other quick wins or ways to improve your site speed please let me know in the comments.